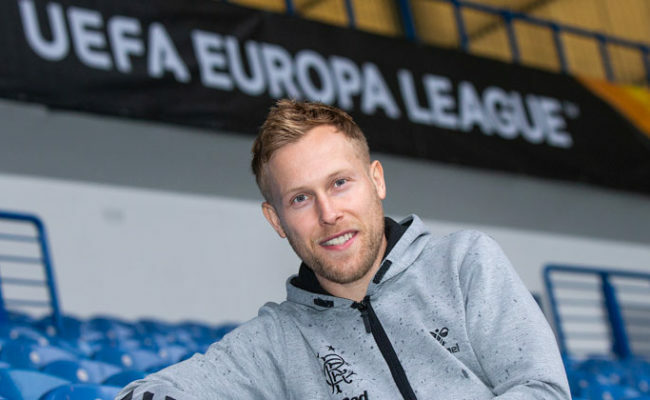 RANGERS made it through to the Europa League third qualifying round this evening after drawing 1-1 with NK Osijek at Ibrox. After winning 1-0 in Croatia last week, Nikola Katic had the Light Blues ahead at Ibrox, before Borna Barisic made it a nervy finish with an equaliser on the night in the final minute of normal time. Steven Gerrard made one change to his side from the one which earned their 1-0 advantage in Croatia last week, drafting Daniel Candeias in place of Jamie Murphy. The Light Blues immediately got on the front foot in the game, although they found themselves in the unusual situation of shooting towards the Copland Road end of the stadium for the first half. They came close to an opening goal too inside three minutes, with an excellent, deep Ryan Kent corner dropping at the feet of Lassana Coulibaly, although it seemed to come to him too quickly and he fired his effort over the bar. From there, Osijek showed their quality for the next 10 minutes or so, taking control of possession without ever really testing McGregor. Gers were pinned back, but then a moment of superb quality from Ryan Jack, who threaded a wonderful ball round the visiting defence and into the path of the on-rushing Alfredo Morelos. He was forced a little wide by the retreating Osijek defenders, but managed to test Marko Malenica with a fine drive. Malenica could’t hold his effort, however, and the ball found its way wide to Kent who crossed to the back-post and forced Malenica into another save to prevent Coulibaly from tapping home. It was turning into an excellent European tie, and after Gers conceded possession in midfield, Osijek broke quickly with Robert Mudrazija testing McGregor at his near post with a decent effort. Back to the other end, and fine hold-up play from Morelos ended with him laying the ball off for Ryan Jack to fire straight at Malenica with a low effort from 25-yards. As half-time approached, McGregor was forced into a pair of fine saves in quick succession. He firstly did well to push away a curling Ezekiel Henty effort before getting up quickly to deny Mudrazija the rebound from an angle. 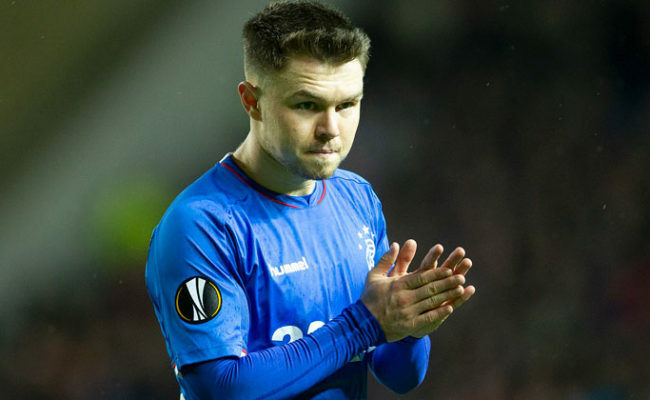 Into the second half, and again it was Rangers making the early play, and but for a fine clearance at the back-post Alen Grgic at the back-post, Ryan Kent would surely have put his side in front after connecting to a Lassana Coulibaly cross. Gers remained up the pitch, however, and after Ovie Ejaria was fouled deep on the right wing, James Tavernier was given the chance to deliver a free-kick. The captain’s ball was right on top of Malenica, who flapped, and allowed the ball to drop to Morelos at the back post. He headed back across goal for Nikola Katic to get his head on the end of to put Gerrard’s men deservedly ahead. It had been a pretty even game to that point, but the home side had really forced the issue from the restart and earned themselves that much-craved cushion in the tie. From there, Rangers were quite happy to control the match, and a deflected Morelos strike had Malenica scrambling backwards before eventually he grasped the ball out of the air, while the Colombian had another half-chance, with an Ovie Ejaria through ball forcing him wide, and his shot could find only the side-netting. A wonderful move of one-touch passing on the edge of the box from Gers ended with an Ejaria curling effort being well-saved by Malenica, but from nowhere, Osijek pulled themselves level on the night through Borna Barisic with just a minute of normal time remaining. After a wonderful save from McGregor to deny Mudrazija, the ball found its way wide to Barisic who unleashed a wonderful drive beyond McGregor and into the back of the net. It was a shock for Gers, and they could have gone back in front in injury-time with Malenica making a decent stop from substitute Josh Windass, while fellow sub Scott Arfield sent an effort straight into the keeper’s arms. 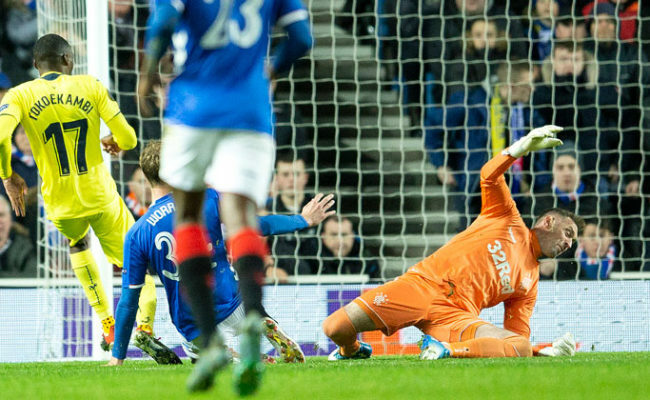 The Gers move on to face old foes NK Maribor at Ibrox next Thursday. RANGERS: McGregor, Tavernier, Goldson, Katic, Flanagan, Coulibaly (Arfield, 75), Ejaria (Halliday, 90), Jack, Candeias, Kent, Morelos. SUBS NOT USED: Alnwick, Murphy, Umar, Windass, Middleton. NK OSIJEK: Malenica, Barisic, Tomelin, Mioc, Bockaj (Sorsa, 66), Mudrazija, Skoric, Grgic, Maric (Strkalj, 66), Hajradinovic, Henty. SUBS NOT USED: Santini, Loncar, Kamenar, Simunec, Pilj.